The third book in Everyman Gaming’s conversion of archetypes clocks in at 21 pages, 1 page front cover, 1 page editorial, 1 page SRD, leaving us with 18 pages of content, so let’s take a look, shall we? Unlike the monk, obviously, the unchained barbarian has a different set of prereqs – this time around, one has to establish terminology for referring to rage powers as provided for the base class and for its unchained version -which Alexander Augunas, with trademark efficiency, does – in short: If it’s an unmodified rage power, it refers to Pathfinder Unchained, while if quoted as modified, it refers to rage powers or sources in books that predate it, modifying it. Characters using an unchained version of an archetype are restricted to unchained rage powers to avoid ridiculous exploits. Interestingly, using unmodified rage powers that do not quote modified ones has also been explained, with just the right level of transparency provided – it does read a bit odd at first, but in practice, it’s a pretty smooth sailing and easily understood. Bloodrage, while still adhering to how many rounds the bloodrager receives,, now nets a +2 bonus to atk, melee + thrown damage and Will saves as well as 2 temporary hit points per HD. The other restrictions of the basic bloodrage remain in effect. Fast movement and Uncanny Dodge also retain their place at 1st and 2nd level respectively. Blood Casting, Blood Sanctuary and Eschew Materials are gained as per the unmodified class and this also holds true for Improved Uncanny Dodge and DR. Things become interesting again at 11th level, with Greater Bloodrage, which increases the bonuses/HP gained per level to +3, retaining the unique casting options now available. The capstone obviously adheres to a similar paradigm, increasing the bonuses to +4 and 4 hp per HD, with spellcasting being delimited. The pdf also converts a total of two bloodrager bloodlines, with the first being “Abyssal” – the modification here, obviously, pertaining to Abyssal Bloodrage, increasing the bonus to atk and damage by +1, at the cost of the AC-penalty increasing to -4. This obviously scales up to bonuses of f+2 and +3 at 16th and 20th level, respectively. The Kyton bloodrager bloodline also has a modification applied to Agony’s Embrace at 12th level, increasing the bonuses granted by +1 for 1d6 rounds or until the bloodrage ends, scaling up to +2 and +3 at 16th and 20th level, respectively. After this solid conversion, we take a look at the unchained skald next, which follows a paradigm similar to the one established for the bloodrager – i.e., the class remains mostly unchanged, with only the required modifications – in this case, the change would e.g. pertain to Inspire Rage, which now grants +1 atk and +1 damage via melee and thrown weapons, +1 to Will saves and -1 to AC, with the scaling, both that of will-saves and the one for the atk/damage-bonuses retaining their consequence in a nice progression. The wording for the interaction with rages of allies has been properly rewired to account for the modifications of the unchained class. Nice: Versatile Performance’s errata has been included – kudos for that! Finally, the capstone has also been properly translated – nice one. After these two base-class conversions, we take a look at 4 archetype-conversions, beginning with the Savage Technologist. Obviously, the bonus to Dex is translated to a straight bonus to attack rolls both with melee and ranged weapons while retaining the damage-bonus for melee and thrown weapons. Proving attention to detail, an ambiguity with Sword and Gun for the purpose of prerequisite-interaction has been cleaned up and Crack Shot actually does a pretty smart job in translating damage-bonuses gained to firearms – a rather subtle, yet great conversion that imho surpasses the base archetype – kudos! Next up would be the Primal Hunter, which remains pretty much unchanged in major ways, probably being here to show that it maintains consistency with the unchained barbarian. The Urban Barbarian’s unchained variant obviously receives a different version of Controlled Rage: In Alexander Augunas’ version, the archetype can choose two options from the following instead of entering a normal rage: +1 to atk (both melee and ranged), +1 to melee and ranged damage, +1 AC and Ref-saves, +1 temporary hp per HD, with the number of selections of benefits scaling up when gaining greater and mighty rage – nice way of codifying the base archetype’s benefits! The final archetype covered here would be the Viking (Fighter)-archetype – which works pretty much unchanged from the base archetype, thus serving more as an example for handling non-barb/bloodrager/skald-etc. classes with access to rage. Indeed, the choice is easily explained and feels valid. The next chapter deals with feats, providing a version of Amplified Rage that is so superior in its clarity, I have to gush for a second: The base feat is a mess from a design aesthetic perspective and Alexander’s version cleans it up perfectly. Nice! The Brutal Blow feat provided herein nets +1/2 melee damage bonus while raging with two-handed weapons, also including a caveat for raging song-interaction. Brutal Maneuvers allows the barbarian to apply the benefits of rage to CMB for maneuver-purposes. Brutal Throw, meanwhile covers that for ranged weapons. These three feats SHOULD HAVE BEEN PART OF THE UNCHAINED BARB IN THE FIRST FRIGGIN’ PLACE. Apologies for the Allcaps, but these three elegant feats eliminate some of the issues that have arisen from the unchained barbarian’s changed rage and ultimately, should have been included in the base class. They are imho required to maintain the options and viability for certain builds and providing these alone justifies the asking price of this pdf. Alexander Augunas also modifies 7 more feats, from Blood Vengeance to Sympathetic Rage – and yes, the tendency to clean up ambiguities present in the base feats in favor of more precise and concise wordings is the red line that works its way through the feats. This is glorious. The pdf also provides two conversions of prestige classes, the rage prophet and the stalwart defender. The rage prophet is fixed in that the new clarity of rage ability allows for the smooth activation of the calm stance rage power, with raging spellstrength also being modified to work organically with this. Greater Rage has been fixed and finally, a new capstone renders the PrC’s 10th level less sucky and mathematically more feasible. Two effin’ thumbs up! The Stalwart Defender’s defensive stance has been completely rewired to adhere to the aesthetics of Pathfinder Unchained, replacing the attribute-related benefits with regular bonuses – but does not stop there: The changed design paradigm translates to a new ability here that allows for longer functionality in negative HP, allowing the PrC to realize its last man-standing premise in a rather nice way, a tendency also emphasized by the new 3rd level free Diehard, which also comes with ignoring of the staggered condition due to being in negative HP at higher levels and even, at 9th level, no longer a loss of hp. 6th level provides greater defensive stance is an organic upgrade of the ability analogue to the design paradigm of unchained rage. The defensive powers are covered, one by one, and, once again, the capstone represents a precise, expanded interaction with the more elegant abilities provided, rendering this more than a conversion. Editing and formatting are top-notch, I noticed no significant glitches. Layout adheres to Everyman Gaming’s full-color two-column standard, though I am no fan of the somewhat shrill turquoise use to accent this pdf. The pdf comes with glorious (obviously, kitsune-themed) original artworks by Jacob Blackmon and the pdf comes fully bookmarked for your convenience. All right, after the marathon of monk archetypes, I did not look forward to this – consider my surprise when I dove in. The streamlining of the other raging classes into Pathfinder Unchained’s design paradigm is extremely smooth, with interaction of previous releases and new rules being aptly and expertly provided. The conversion itself follows Alexander Augunas’ established paradigms and is, obviously, a smooth sailing that sticks close to the base matter at hand. Though not as close as before – while only evident to the truly discerning and analytical eye, this pdf does, imho, more regarding design-prowess than previous installments in the series. What do I mean by this? Well, I’ve been developing quite a bunch of rules and cleaned up a significant array of crunch at this point. There is more to writing crunch that making things that work with the proper language – one also has to adhere to a certain aesthetic to maintain a sense of cohesion when applying fixes. This pdf does just that – while subdued and subtle, this pdf essentially takes some of the rather glaring holes generated by the new rules and fixes them – especially among the feats and PrCs, the accomplishment in design is more than apparent – the feats open up whole builds that have been hobbled by the new rules and as such should have been provided in Pathfinder Unchained. The very conservative application of minor fixes and streamlining of wordings of highly problematic base options further enhance the experience of making this, quite frankly, a must-have offering. This pdf is an achievement, but one that requires some thought and analysis to get why it’s this good – at one step beyond just conversions, this pdf constitutes a must-have purchase for ANY group that uses Pathfinder Unchained and represents one of the most subtly-impressive pdfs I’ve seen in quite a while. My final verdict will clock in at 5 stars + seal of approval. You can get this awesome supplement to bring the FURY to Pathfinder Unchained here on OBS and here on d20pfsrd.com’s shop! Surely Unchained Rage comes under the “other effects” clause and provides a CMB bonus in and of itself without requiring a feat? The issue here lies in the wording of the Unchained Barbarian’s rage: “While in a rage, a barbarian gains a +2 bonus on melee attack rolls, melee damage rolls, thrown weapon damage rolls, and Will saving throws.” That’s specific – not “attack rolls”, but only “melee attack rolls” etc. – this does NOT include CMB, as per RAW and alas, specific rules trump generic ones. I agree it does not make much sense and most groups won’t note this distinction in the first place…but there you have it. So, depending on your interpretation, this *may* be redundant. The second component of the feat is anything but redundant, though – for any group: Allowing characters affected by raging song to partake in your rage-granted bonuses to CMB in addition to those your song grants them? Any time you initiate one? That’s pretty damn neat and all your maneuvering allies will love you for it. Thanks for commenting, Sayt – I hope I have been of help! CMB checks are explicitly attack rolls (as stated in the CM rules, paragraph after the section I cited in my previous post), and the ‘Melee Attack’ section under the Standard Action header states that “a single melee attack can be a disarm or sunder combat maneuver, but not both”, so there is RAW support for CMB checks performed in melee/with melee weapons being considered “Melee Attacks”. That said, I wouldn’t necessarily be surprised if the rules were contradictory! 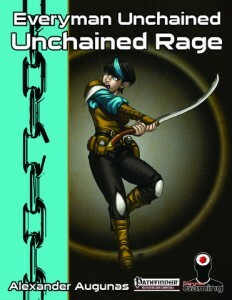 And I haven’t had a chance to read Unchained Rage itself yet, I was just basing this on your review. That being said, I’ve found your reviews for Unchained-compatible 3pp material helpful! Well, I’m aware of it – and yes, you’d be right in assuming a contradiction or at least a massive ambiguity in the base rules provided. Consider Reposition compared to Trip. Trip uses a weapon to complete, and therefore any affects that increase the weapon ability to hit also increases the ability to trip (e.g. Weapon Focus, Magical Enhancements, Weapon Training etc). Reposition does not use a weapon and therefore has a harder time of getting increases to succeed. However, if you can use your attack roll instead of your CMB on Reposition, then you gain those extra bonuses to the combat maneuver. I’m no rules expert, but this is how I would see that it makes a difference. Hej Sam! Thank you for commenting – that’s actually a component I did not take into account – you make some valid observations here! Thanks for those!! !